Home > English for Yes > I am English voting Yes for Scotland the land that is my home. 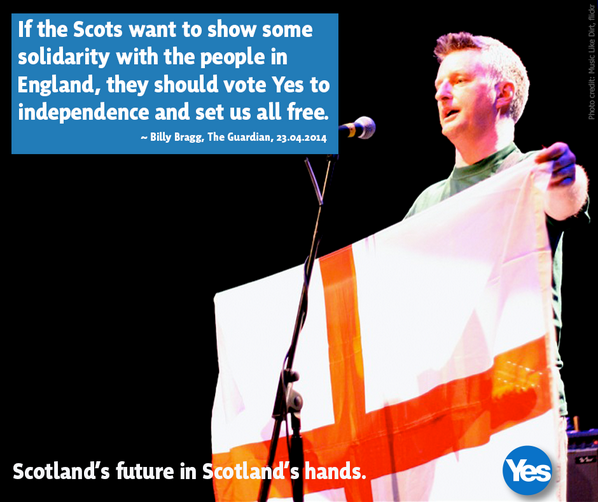 I am English voting Yes for Scotland the land that is my home. I have been interested in politics for as long as I can remember and decided I was a Labour voter at the age of nine although my family never showed much political interest. Throughout the late 70’s and early 80’s I marched with the anti Nazi league and supported the Labour party. I met and married a Scotsman 25 years ago. We lived in Yorkshire the place of my birth but always hankered after moving to the Highlands where we holidayed every year. Ross my husband was a shop steward at Sellafield and worked there for many years, I worked in a textile mill in my home village. After 13 years I was made redundant and Ross left Sellafield. This was the turning point and we decided to make the move to the Highlands. I always loved our visits to Scotland both to my husbands families’ areas of Greenock and Port Glasgow and to the Highlands .I felt an affinity with the people, a shared political background although my introduction to sectarianism I found bewildering. I admired the people of Scotland who fought so hard against the poll tax and suffered the dismantling of their industries and never forgave the Tories for their injustice. We moved to The Highlands ten years ago and in that Ten years I have become more and more in love with the area in which live. Our son has had a fantastic education here and at Glasgow university, we have a health service to be proud of and people in the community are supportive where ever you come from, who ever you are. It’s not a bed of roses though and there is a lot of hidden poverty in the Highlands and we have got the inevitable food bank just being set up in the local village. Should food banks be inevitable?. I think not. Should the downgrading and privatisation of the NHS be inevitable? I think not. Should people be classed as scroungers if they need help in the hard times? I think not. Should the indigenous culture of my area be sidelined and ridiculed? I think not. Should we be dragged into more illegal wars and have expensive nuclear weapons sitting in our waters? I think not. If Scotland votes no in the referendum I think all those things could become inevitable as the Westminster elite lurch further to the right .The prospect of a Con/UKip government is a nightmare scenario for me and many others in Scotland. If Scotland votes yes we can have a different outcome, a fairer more equitable outcome. A Scotland going forward with our own agenda that works for Scotland and it’s people. Our government voted for by our people. Great article Jayne. My wife is also from Yorkshire and you reflect her sentiments exactly. Nice to hear. I’m Glad that you will be helping to build a better Scotland. it sounds great,, I hope the planning will be success !!! Well said, Jane. Sorry, Jayne…. Good article Jayne. My paternal grandparents came from Yorkshire to Glasgow (individually) in the 1920’s looking for work, found it, found each other and stayed. My brother, sister and myself learned (to varying degrees) how to cook, bake, knit, sew and eek out our pocket money from Granny. Granda would take us all to Shettleston Juniors football matches and would treat the whole family to the theatre twice a year. They loved Glasgow and Scotland, it was their home for 40 years. The best of my early life came from my Yorkshire/Glasgow grandparents. Looking forward, as you are, to a better future for us all in Scotland! Reblogged this on A View from Clinkman's Dome. Well written Jayne, you made your points clearly with a sharp wee punch. I think your article shows that independence isn’t about the SNP or hating the English, it’s about a desire for something better, social justice and a more humane society. Completely off the main topic, but we have a tradition in our family of marrying Yorkshire women. My Gran and my mum were both born and brought up in Yorkshire, and my wife only moved to Scotland from Sheffield as a teenager. It’s always a good thing to bring up when unionists start accusing me of being an anti-English racist. Thanks Robbie, yes a desire for something better. Jayne the media likes to make the YES campaign about Scotland V England … that is clearly not the case … take the Snp government as an example, it has English born MSPs, it has MSPs born in different EU countries and MSPs from different ethnic backgrounds in Scotland and many people that have not been born in Scotland back the Yes campaign because they have confidence we can do things different and more fairly than Westminster … I have always said this “I would rather be a good neighbour than a disgruntled partner and I can’t see how Independence can be a negative for Scotland and the Rump of the UK …. I can see it heralding a new and fairer partnership with the rest of the UK.